The Quiksilver Pro France, Stop No. 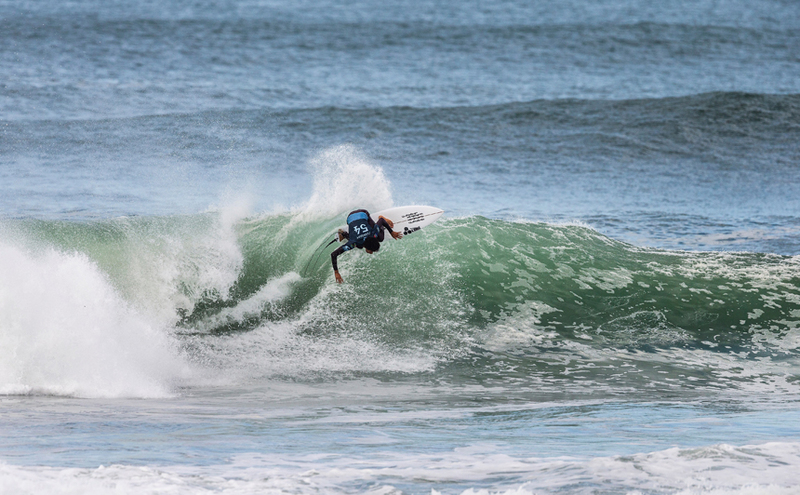 9 on the World Surf League (WSL) Championship Tour (CT), resumed today in pumping six-foot surf at Culs Nus to complete the second and third rounds of the men’s event. Current Jeep Frontrunner Filipe Toledo took on lethal wildcard Ryan Callinan in firing lefts at high tide this afternoon. The Brasilian seemed to have everything under control, even scoring the event’s best ride, an incredible 9.00 (out of a possible 10), and backing it up with 7.60 to put his opponent in a combination situation. But, Callinan never looked defeated and fought back to take an incredible come-from-behind victory with his last two efforts of a 7.93 and an 8.87. The Australian, who received a replacement wildcard for being the best non-CT surfer on the Qualifying Series, played spoiler in the World Title race today by eliminating Toledo, giving Gabriel Medina a golden opportunity to overtake his compatriot in the rankings. A strong South wind came up and rendered conditions slightly more difficult for Medina and Wiggolly Dantas in the following heat. Despite the obstacles, the World No. 2 seized every opportunity he could get and managed to take an important win into Round 4. The opening matchup of Round 3 between Matt Wilkinson and Italo Ferreira was an amazing battle of backhand powerhouses on the clean rights at Culs Nus. An opening exchange on two extremely similar waves went Wilkinson’s way by the slimmest of margins. The heat continued with surfers trying to back up their main score, but it all eventually came down to a last-second effort from both athletes. Once again judges had to take their magnifying glasses out to dissect the subtle differences in each ride. When the dust settled, it was Wilkinson who came out on top by 0.06 to upset World No. 4 Ferreira and move on to Round 4. Heat 2 and 3 witnessed top seeds Conner Coffin and Jordy Smith take short victories over recent Red Bull Airborne winner Yago Dora and Ian Gouveia respectively. Willian Cardoso survived a tight battle with Connor O’Leary and jumped back in the lead with seconds on the clock for his spot into Round 4. Former Quiksilver Pro France winner Adrian Buchan and 2015 WSL Champion Adriano de Souza went head-to-head in Heat 5, but the Brasilian cut the battle short with one of the event’s best waves, an incredible 8.70 (out of a possible 10). De Souza started on a double-overhead bomb with a clean wall and locked in a combination of fully committed gauges under the lip. The men’s second day of action witnessed the early elimination of Frenchmen Jeremy Flores and Michel Bourez in Round 2. On the men’s side, sophomore Joan Duru will be the sole representative of the home nation when the event resumes, facing World No. 3Julian Wilson in Heat 12 of the third round. The women’s Roxy Pro heat draw is now set for Round 3. Round 3 will mark the first elimination heats for World No. 1 Stephanie Gilmore and World No. 2 Lakey Peterson. With a World Title on the line in France, both surfers need to dodge early exits. For Gilmore, losing before the Semifinals means she will be unable to clinch the World Title early. For Peterson, she will need to finish ahead of Gilmore in order to push the race to the last stop on the WSL Tour, the Beachwaver Maui Pro.